The northern South China Sea. China has lost an important international legal case over control of strategic reefs and atolls that it asserts give it the right to control much of the South China Sea. It has been rapidly militarizing some of these features to cow other nations with claims in the region, through which goes 30 percent of world trade in physical things. But expansionist dictatorships have a tendency to ignore international law. The judgment by an international tribunal in The Hague overwhelmingly favors claims by the Philippines and will intensify diplomatic pressure on Beijing to scale back military expansion in this geopolitically very sensitive area. 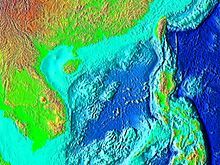 As The Guardian noted, “By depriving certain outcrops of territorial-generating status, the ruling effectively punches holes in China’s all-encompassing ‘nine-dash’ line that goes almost ridiculously far into the South China Sea, far, far away from China. China predictably denounced the verdict, which declares large areas of the sea to be neutral international waters or in the exclusive economic zones of other countries. Xinhua, the country’s official news agency, attacked what it called an “ill-founded” ruling that was “naturally null and void”. The Communist Party newspaper the People’s Daily said that the tribunal had ignored “basic truths” and “tramped” on international laws and norms. “The Chinese government and the Chinese people firmly oppose [the ruling] and will neither acknowledge it nor accept it,” it added. Video: Steps to discourage exits from the E.U.